LAST month sister mag Wheels Magazine revealed that a Ford Ranger was leading a Tickford revival. Tickford has officially confirmed that news today. 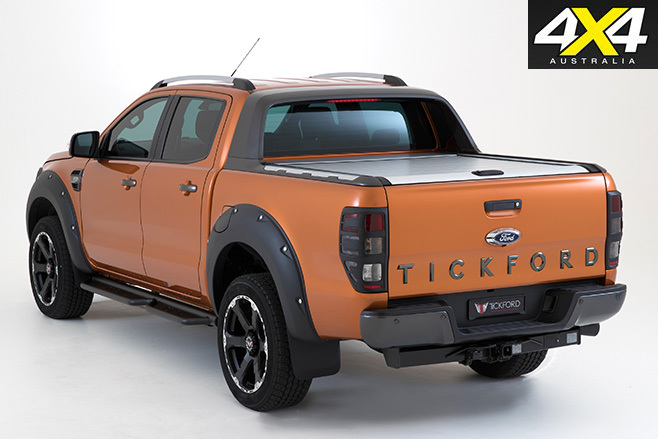 After a 15 year hiatus on these shores – Tickford last operated in Australia in 2001 – Tickford is returning by offering vehicle personalisation packages on a range of models, namely the Ford Ranger and Mustang. “With [the] Ranger we are working with a utility vehicle that has proven to be a game-changer since it was launched. The emerging ‘tough truck’ market has been calling out for a quality offering and we believe we will deliver that,” said marketing director, Peter Trevaskis. 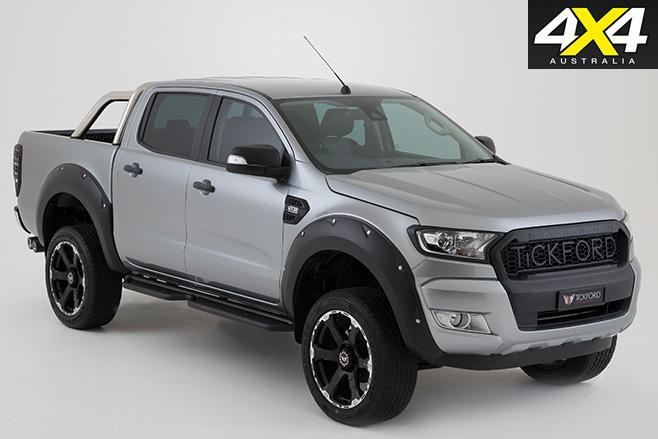 With a focus on Ford’s PXII Ranger, Tickford engineered performance components with an eye on four key areas of development: powertrain, ride and handling, exterior styling and interior styling. To improve the Ranger’s powertrain, Tickford will offer a Powertrain Upgrade package. This includes an intercooler upgrade; a 2.5-inch catback exhaust upgrade; a custom diesel tune; and a driveline warranty. The custom diesel tune (also compatible with the previous-gen Ranger) is said to “deliver up to 15 per cent more power and up to 20 per cent more torque.” It also improves throttle response. “The Powertrain Upgrade is somewhat a signature package for Tickford and is something our technical team is very proud of,” Tony Harris, Tickford’s director of performance parts, said. The powertrain package can be fitted for $7995. To improve ride and handling a Suspension package, which includes Bilstein dampers, can be fitted for $1285. Adding a Kings Springs two-inch lift raises the price by $560. A 20-inch Wheel/Tyre Upgrade package includes 20-inch alloy wheels and sports tyres; a tyre pressure monitoring system; Tickford centre caps; and fender flares. Fitment for this package costs $4530. All ride and handling products have been ADR approved. Adding sidesteps costs $1375, while ticking the options list for headlight surrounds, mirror covers, and tail-light covers adds $350. Door handles (XLT); quarter vent covers (XLT); and a tailgate handle (XLT) will cost $300 to fit. On the inside, front and rear OEM-spec leather seats and interior applique costs $3905. A leather steering wheels adds $730; while door sills costs $105. Bear in mind, all prices are subject to change. Ranger personalisation packages will be available directly to customers from Tickford Modification Centres. A centre is opening in Melbourne this month, while centres in Sydney (later this year) and Brisbane (2017) are coming soon. Ranger Raptor set to reign in wayward race cars. Caravan Industry Association of Australia offers up the chance to win a Pedders MS-RT Ford Ranger and Jayco Adventurer.